Titus was equipped with the trusty Chain Sword for melee combat, a Vengeance Launcher (Warhammer 40K's chunky version of a grenade launcher) and special moves like the Bull Rush. Titus can charge his Ork foes, stunning them, shattering their guard, then setting them up for close quarter combat and executions—moves that will recharge the Space Marine's health faster. Those executions are appropriately gruesome, with Titus' Chain Sword thrust through the torsos of Orks, violently ripping through their insides and causing an explosion of gore. Captain Titus' combat arsenal also includes the ability to fire with a slow motion "bullet time" effect—lending Space Marine an even heavier, sludgier feel—and a strong area of effect attack that looks handy in crowds. After dealing with dozens of Orks, splashing the screen with their blood and a chunky, metallic trot through the Forge World's factories, we jumped to an earlier chapter in which the Space Marines were tasked with taking control of an orbital defense cannon. Our demo wrapped with a jump forward into the game's fourth major chapter, "The Coming of the Chaos." Warhammer 40,000 fans likely won't be surprised to learn the game introduces the forces of Chaos at this stage. That's the thing about Space Marine for me. It's ominous and imposing, like its warriors, strangely beautiful in parts, mostly dreary and grim in others. It's not an ugly game, as Titus and his enemies are lovingly detailed in their ornate armor and alien forms. Things move smoothly. Hundreds of pounds of marine armor move hypnotically as Titus runs. Orks die spectacularly. But it is a game about an ugly war on an unattractive planet, a violent fantasy that's at least visually interesting if not immediately appealing to this non-fan of things Warhammer. 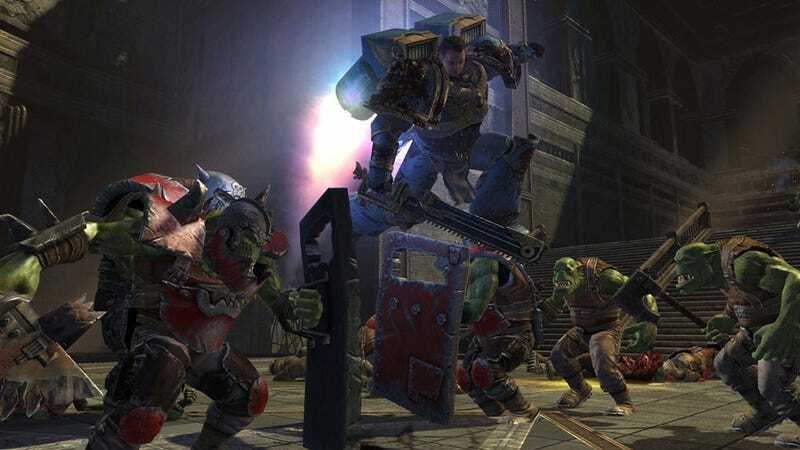 There's a mass and force to everything in Space Marine that we rarely see, with fighters bulkier and more imposing than even the meaty men of a Gears of War. So I can appreciate how satisfying this game might be for the Warhammer fan, the people this game is squarely aimed at, for Space Marine is a chance to assume the role of an iconic warrior and take part in battles fans rarely see from this perspective. Warhammer 40,000: Space Marine has a certain style—make sure to check out new video and screenshots in the gallery—even if it's not the most convincingly inventive of third-person shooters. We'll have to see how the promise of seamless melee and gunplay feels for ourselves at E3 2011 to be sure. Warhammer 40,000: Space Marine is scheduled to be released by THQ and Relic worldwide for the Xbox 360, PlayStation 3 and Windows PC on September 6, 2011.